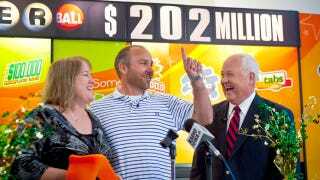 When you win a $200 million-plus lottery, you can pretty much screw with people however you want, especially if you're willing to pony up for something they really want or need. Take Brian and Mary Lohse, who won a Powerball jackpot some three months ago and finally decided they would make a hefty $3 million donation to their son's school so that administrators could construct a swanky new football stadium. I mean, this is Iowa, and people love their high school football, right? The stadium visitor's locker room must be painted pink. The Bondurant-Farrar school district accepted the $3 million donation from Brian and Mary Lohse on Monday, The Des Moines Register reported. The couple from the Des Moines suburb of Bondurant requested only that the new stadium be completed before the fall 2014 football season - their oldest son's senior year - and that the visiting team's locker room be painted pink. "I was sort of half joking and half not, I suppose, but they said they'd do it," Mary Lohse said of her scheme, inspired by the University of Iowa visitor's locker room at Kinnick Stadium, which is also painted pink. "It's supposed to put them in a certain soft frame of mind," Mary Lohse said. "It will certainly give all the players something to talk about." Now, other than cornfield baseball, is there anything more Iowa than pink locker rooms? Tough call.